Monday, October 9 10:30 p.m. If you’ve ever dreamt of riding your bicycle in 40,000 square feet of polished cement in the gorgeous globalized Alameda Industrial Corridor just east of downtown Los Angeles – this is your chance! Pre-fab walls will be built into the space in the very near future, so please do join us and bring your friends. * if you have a way to play music from your bicycle & you would like to dj roller-rink style, please bring your rig & rock us! 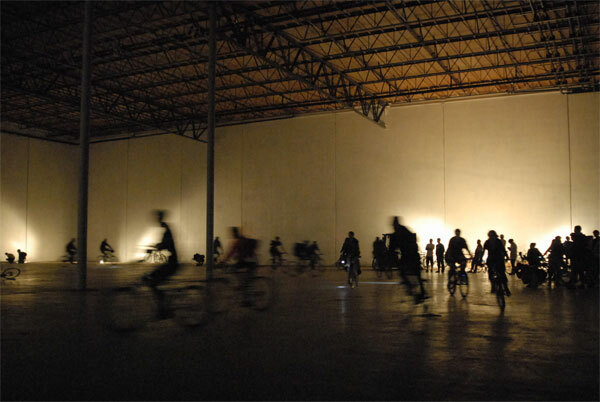 * if you have other ideas of ways to engage dozens of cyclists in a large empty industrial space, come prepared to lead a free-wheeling follow the leader!